University of Texas, Austin, September 1973-December 1975 B.A. in Chemistry with Highest Honors. University of California, Berkeley, September 1976-June 1980 Ph.D. in Organic Chemistry (with C. H. Heathcock). Columbia University, 1980-81 NSF Postdoctoral Fellow in Organic Chemistry (with G. Stork). 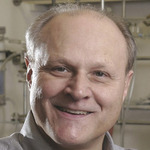 Michael Pirrung was trained as a synthetic organic chemist via academic studies at UT-Austin, UC-Berkeley, and Columbia University. His first faculty position was in the chemistry department at Stanford in the early 80s. In the late 1980s, he joined a working group of scientists forming a then-new company, Affymax. He established the chemistry program at Affymax, focusing on new methods of creating chemical diversity. His work there included the co-invention of microarrays, and he has been called “der Vater des DNA-Chips”. His Science paper on this work was recognized with the 1991 AAAS-Newcomb Cleveland Prize and, two decades later, is in the top 1% of most highly cited papers worldwide. The patent family based on his 1992 microarray patent US 5,143,854 was in the top ten most cited patent families during 1999-2004. This patent estate also led to his receiving the 1993 Intellectual Property Owners Distinguished Inventor Award, the 2004 Chemical Pioneer Award of the American Institute of Chemists, and the 2006 European Inventor of the Year (for small and medium-sized enterprises). He has been a visiting professor at UC-Berkeley, Baylor College of Medicine, Oxford, UC-San Diego, UC-Irvine and Caltech. He has held Hertz, Sloan, and Guggenheim fellowships and a NSF Presidential Young Investigator Award. In 1990, Pirrung joined Duke University, where he founded and directed the University Program in Biological Chemistry and Biotechnology for Business, an educational outreach program for non-scientists. In 2004 he joined the UC-Riverside Chemistry department as UC Presidential Chair and in 2012 was named Distinguished Professor. His current research emphasizes organic synthesis and combinatorial chemistry. He has over 160 peer-reviewed publications and over 40 US and international patents, and has authored five books. Can your mind make your body sick? A written research plan (alert! : highly technical) is provided.